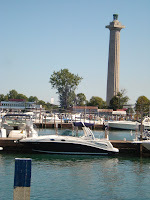 No summer is complete without a trip to the Lake Erie islands area and of course, Put-in-Bay. In keeping with my trip-down-memory-lane theme from yesterday, this is the pl ace where Bob and I met. 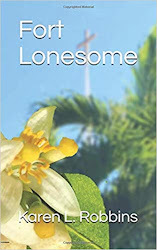 He was a cabby driving one of the antique cars the cab drivers used in those days and I was the pizza girl in the little take out place tucked into the corner of the Round House opposite the chicken pit. The chicken pit is still there. The pizza place and the old cabs are gone. Put-in-Bay (the name comes from Commordore Perry saying, "Put in the bay!" 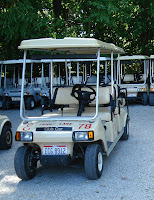 after his battle) is a great place to wander around either by golf cart or by bicycle. After stopping in to say hello to my brother and his family who live there year round, we visited Perry's Victory and International Peace Memorial ( The Monument, to locals) and took a trip to the top. The weather was perfect for it. We could actually see the Canadian mainland--a rare occurence. Be aware the monument is still experien cing repairs and will again be closed to visitors for a couple of years after this September. The mortar needs work. In the past, they have had a couple of pieces of the monument fall. 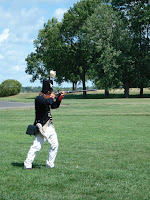 Outside on the lawn, we watched one of "Commodore Perry's men" load his single shot musket and fire it. Our grandson quipped, "That's better than a cap gun!" When the soldier got a bit graphic later in his talk of attaching the bayonet and how to use it, we moved on. After our trip for a view from the top, we drove out to East Point, reminiscing along the way, and then over to Oak Point where the state fish hatchery is located. There are several displays set up inside about fish in Lake Erie and the way eggs were collected and hatched in the past. Outside, kids under 15 are allowed to borrow a pole and fish off the dock under the supervision of a ranger who helps out. 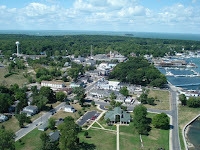 Many recreational and shopping areas have been added over the years we've spent going to the island. 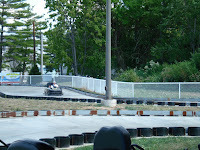 We took the grandkids to the electric go-karts and the arcade behind them. There is also an antique carousel on the main street. Lots of boutiques allow for great shopping opportunities and plenty of places to grab something to eat. We opted for the Boardwalk where those who liked fish could get some perch and others could get hamburgers. Later, we stopped at what used to be Cooper's Restaurant but is now called The Goat Soup and Whiskey. Underneath the restaurant is a great place for candy and ice cream cones--really big ice cream cones. A trip out to the state park, a walk along the beach, a few stones skipped in the water, and we returned our golf cart and boarded the ferry for home. The grands are getting older. We no longer have to carry them up to the car, sound asleep from their busy day. More fodder for memory lane.